These unique personalized light blue baby boy baseball plaques are made with baseball letters which spell out any name you would like...up to 10 characters. The number of characters determines the size and price of the plaque. Use the letter chart to tell us which image you would like for each of your letters. ~ Exclusive baseball letter art photography like no other. ~ All wood is 100% post consumer. 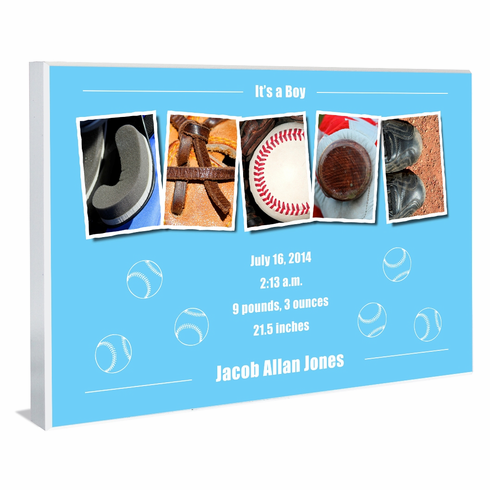 ~ Light blue background, white sides and borders, white text, baseball letter art photo letters. ~ Satin lacquer finish resists scratching. ~ Opening on back for easy hanging.